Keaontay Ingram expects to take a licking in 2019. But he’s gone into the weight room this offseason to make sure he keeps on ticking. 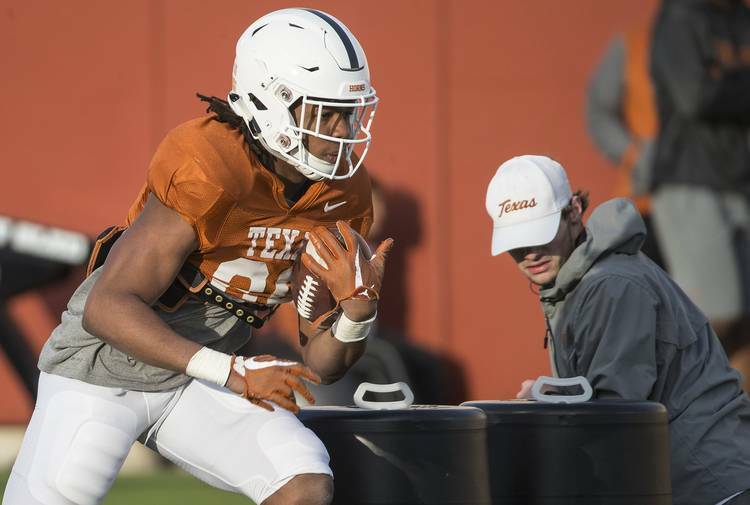 The sophomore has added some bulk to his 6-foot frame since the expectation is for him to become the featured ball carrier in the Texas backfield. Former running mate Tre Watson helped shoulder that load during Ingram’s freshman season that saw him never reach his full explosiveness because of injury but the Carthage product is having a nice spring with his new look. Coach Tom Herman said the explosiveness has shown up because of the extra work in the weight room with strength and conditioning coach Yancy McKnight. Ingram told reporters this week that he weighed in at 217, up 12 pounds from his playing weight in 2018. He says adding the additional weight hasn’t slowed him down one bit. Teammates have noticed as well. I love Ingram’s upside. He’s fast but isn’t quite the home-run hitter Jamaal Charles was in his three years here and in the NFL — where his 5.4 yards per carry are the best by a running back in league history — but he does have really good vision and possesses that natural ability to make the first guy miss. Forgive my bias but Ingram is ready for this step up in workload because he played played big-boy football in East Texas. He averaged a modest 14.8 attempts during his senior year for the Carthage Bulldogs, who won a second straight Class 4A Division I state championship in 2017. The high-school All-American ran for a mind-numbing 2,327 yards, averaged 9.8 yards per carry and scored 37 touchdowns. In 2016, he ran for 2,244 yards but had a heavier work rate at 21.3 carries per game. Either way, he’s ready to be the guy in a backfield that includes veterans Daniel Young and Kirk Johnson and newcomer Jordan Whittington from Cuero. Young served as a chain-moving late-game closer of sorts last season while Johnson, the son of Texas legend Johnnie Johnson, hasn’t seen much of the field in three injury-filled seasons. Whittington, who scored six touchdowns in the Class 4A Division II title game, is already drawing raves from his teammates for his breakaway speed. The coaches did a good job of monitoring Ingram’s carries last season but his history suggests he can carry the load if needed. The biggest question is if he will be the next great state-produced Longhorn runner, following in the tradition of Steve Worster, Roosevelt Leaks, Earl Campbell, Cedric Benson and Jamaal Charles or if he will fall short of his high school hype like previous backs Johnathan Gray and Malcolm Brown, prep All-Americans who never took full flight in Austin. Speaking of hype, Watson, who was a great mentor to Ingram during his graduate transfer year, indicated to reporters before the Sugar Bowl that he believed Ingram would one sit atop the college football. Ingram admittedly loves a challenge so why not embrace the Heisman talk? “I’m not going to run from it but that’s the last thing on my mind,” he said. If the spring is any indication, he’s just as likely to run through it.